Six cadets from Nottinghamshire attended a special flag raising ceremony at Wollaton Hall in Nottingham, Monday 24 June 2013, to mark the start of an exciting week of activities organised ahead of Armed Forces Day. 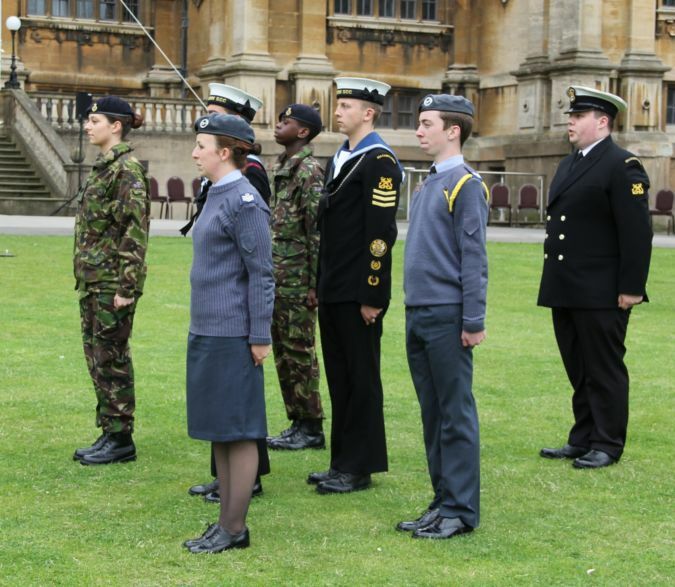 Two Sea Cadets, two members of the Army Cadet Force and two cadets from the Air Training Corps attended the event, along with East Midlands Reserve Forces and Cadets Association’s Head of Youth and Cadet Services, Deputy Chief Executive Simon Worsley. The flag raising event was organised to celebrate and pay tribute to the men and women – past and present of the Royal Navy, Army and Royal Air Force and also to show our thanks for all the invaluable work they have done for us at home and on our behalf overseas. Simon Worsley, Deputy Chief Executive from East Midlands Reserve Forces and Cadets Association, said: “This ceremony was an excellent way to mark the beginning of a week of activities leading up to the National Armed Forces Day event in Nottingham of which the cadets are involved in a number of different ways. For example there will be three marching contingents each of 30 cadets and two adult volunteers, plus an Air Training Corps marching band in Nottingham City Centre on Saturday (29 June) as well as a range of special activities at Nottingham’s embankment such as an Army Cadet Force band performing on the community stage and a Rifle Drill display from the Air Training Corps in the main arena.